The CW network has renewed five of its TV shows for the 2011-12 season, amounting to most of the small network’s current slate of programming; 90210, America’s Next Top Model, Gossip Girl, Supernatural, and The Vampire Diaries. There aren’t really any surprises in the renewals. All but Supernatural are tops in the network’s targeted demographic of females 18-34. Supernatural airs on Friday nights and gets understandably lower numbers. With Smallville signing off in May, The CW can use venerable Supernatural to anchor the night. With the renewals, this leaves the fate of One Tree Hill, Hellcats, and Nikita up in the air. Reality series Shedding for the Wedding was all but dead on arrival and surely won’t be back for another round. April 26, 2011 (Burbank, California) – The CW Network has given early pickups to five of its established series for next season, including an All-Star Cycle of AMERICA’S NEXT TOP MODEL and the network’s top-rated drama THE VAMPIRE DIARIES. All five shows will return in Fall 2011. More about: 90210 (2008), 90210 (2008): canceled or renewed?, America's Next Top Model, America's Next Top Model: canceled or renewed?, Gossip Girl, Gossip Girl: canceled or renewed?, Supernatural, Supernatural: canceled or renewed?, The Vampire Diaries, The Vampire Diaries: canceled or renewed? The vampire diaries the best show ever!!! I’m really happy there giving supernatural a new season and vampire diaries ! (: but I would really like hellcats to be renewed too.. It would be a shame .. I CANNOT BELIEVE IT! I wanted Supernatural to be canceled the same way as Without a Trace, and Vampire Diaries is the worst TV series out there that it doesn’t deserve a fourth season. But at least 90210, Gossip Girl and AMTM are coming back. 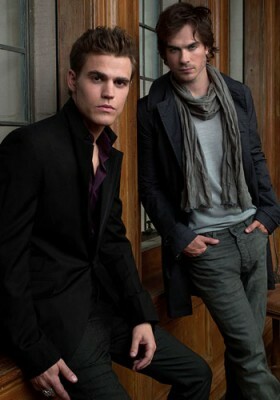 Vampire Diaries…what a guilty pleasure! Glad it’s coming back. I’m very happy about “Supernatural”, but now I’m extremely worried about “Hellcats”! I really love that show! Man I hope that Nikita ends up getting renewed, or at least ends in a good way. @kim: supernatural and the vampire diaries are US shows. supernatural is filmed in canada. the vampire diaries filmed the pilot in canada but they film in georgia.